Like Abraham Lincoln, Jefferson Davis was a native Kentuckian who left the state at a young age and ultimately succeeded in becoming president. The two also shared ties to the Clay family, but Davis’s connections with the Clays were much more direct and intimate than those of Lincoln. Davis knew Henry Clay personally, meeting him at a young age. Davis would later rise to be Clay’s colleague in the U.S. Senate. Davis admired Clay and remembered his friendly tones from youth, but never idolized him the way Lincoln had. In fact, Davis would later stand in firm opposition to Henry Clay. The most significant tie that bound Henry Clay and Jefferson Davis was Henry Clay Jr.. Jefferson Davis was a schoolmate of Henry Jr.’s at Transylvania University, was a fellow cadet at West Point, and, finally, was a brother in arms at the Battle of Buena Vista in the Mexican War. It was this final connection that would make Jefferson Davis and Henry Clay Jr. brothers in blood for all time. And it created an unspoken, unbreakable bond between Davis and Henry Clay. 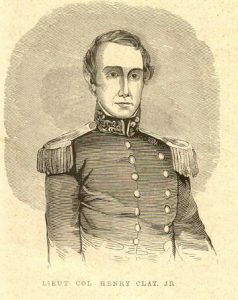 Henry Clay Jr. is shown here in his Mexican War Uniform. Henry Clay feared civil war and hoped he would never live to see it. Henry Clay got his wish, but the two men he influenced-Lincoln and Davis-did not. When the Civil War broke out, these two Kentuckians would rise to lead the opposing nations to which they claimed citizenship. Six of Henry Clay’s grandsons would fight in the war and five of them would choose to follow Jefferson Davis and the Confederacy –along with Henry Clay’s son, James. 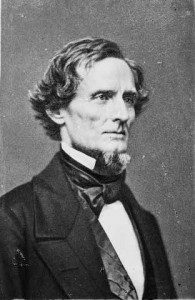 Jefferson Davis was not politically or ideologically close to Henry Clay, but he was personally attached. Those attachments had a distinct impact on Davis as a prominent antebellum leader. This website published in cooperation with the Kentucky Department of Travel Development.